Thinking Out Loud In Sturbridge: "Marge, That Darn Mouse Is Back." I am not quite sure when this photograph was taken. Probably in the mid 1960's to early 1970's. At one time "Cheese Houses" were everywhere there were tourists. The photograph is an old postcard, and although the card reads on the backside that it is the Cheese House in Sturbridge, it is hard to believe that the Sturbridge landscape once looked like this. Quite nice, actually. Except for the mouse. 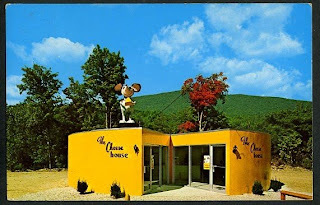 "The ...Cheese House ... was part of the Cheese House chain which had 18 cheese-shaped locations in New England. Apparently, there are only these two buildings left. The stores were built in the late 1960s and early 1970s. They were constructed of wood with a cut-out wedge for the entrance and windows. They are 9' tall and 40' in diameter. In the late 1970s, the chain disbanded due to financial problems." Source. If you have any old postcards, or photos of Sturbridge, and would like to share them here. Let me know. It's easier to know where we're going if we know where we've been. There's a cheese building in Wells, Maine too. If you click on the word "source" after the quote above you will learn more about the Wells Cheese House. I expect to see Tinky Winky and Dipsy pop their heads out of the beautiful rolling hill behind the cheesehouse! Telletubbybridge, MA. "...the card reads on the backside that it is the Cheese House in Sturbridge..."
I have a postcard with that exact same picture, but mine says "Trenton Maine". There is indeed a cheese wheel on Rt3 at the intersection with 204, but it has been through many changes. The hill in the back could be Mt. Cadillac. Thank you, Paul. Could have been a generic view, and labeled with whatever location they needed at the time.